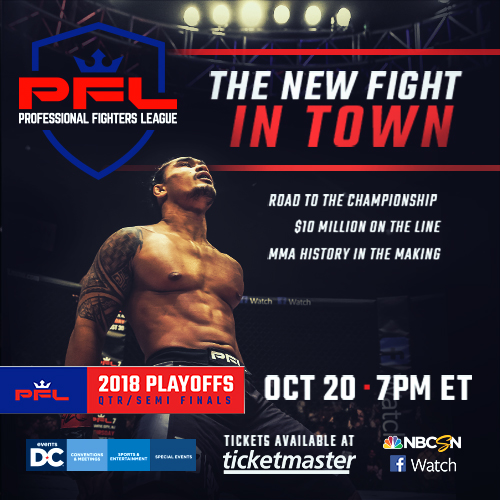 PFL 2018_10: Playoffs is an upcoming mixed martial arts event that will be held on October 20, 2018, at the St. Elizabeths East Entertainment and Sports Arena in Washington, D.C., Unites States. Middleweight TBD vs. TBD Semi-final round bout of the 2018 PFL Middleweight playoffs. Welterweight TBD vs. TBD Semi-final round bout of the 2018 PFL Welterweight playoffs. Middleweight Abuspiyan Magomedov vs. Gasan Umalatov Quarter-final round bout of the 2018 PFL Middleweight playoffs. Welterweight Ray Cooper III vs. Jake Shields Quarter-final round bout of the 2018 PFL Welterweight playoffs. Middleweight Bruno Santos vs. Sadibou Sy Quarter-final round bout of the 2018 PFL Middleweight playoffs. Welterweight Rick Story vs. Handesson Ferreira Quarter-final round bout of the 2018 PFL Welterweight playoffs. Middleweight Shamil Gamzatov vs. John Howard Quarter-final round bout of the 2018 PFL Middleweight playoffs. Welterweight Magomed Magomedkerimov vs. Pavlo Kusch Quarter-final round bout of the 2018 PFL Welterweight playoffs. Middleweight Louis Taylor vs. Rex Harris Quarter-final round bout of the 2018 PFL Middleweight playoffs. Welterweight João Zeferino vs. Bojan Veličković Quarter-final round bout of the 2018 PFL Welterweight playoffs. Middleweight Eddie Gordon vs. Artur Alibulatov 2018 PFL Middleweight playoffs Alternate. Welterweight Abubakar Nurmagomedov vs. Yuri Villefort 2018 PFL Welterweight playoffs Alternate. 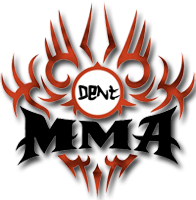 The event will be the tenth of the 2018 season and will mark the start of the playoffs for the Middleweight and Welterweight divisions. Joah Zeferino is out with a knee injury, so the alternate Abubakar Nurmagomedov will replace him.